No party is complete without a light and salty snack. Adding a popcorn machine rental to your party adds a popular and inexpensive snack that both kids and adults will both love. 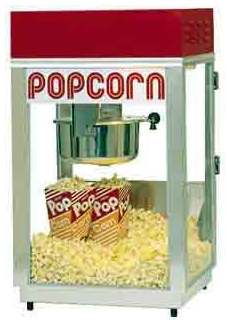 We provide popcorn machine rentals in Boston to make your party fun and keep all your guests satisfied. You can make your popcorn machine rental a part of your complete food, snack and entertainment party package or rent the popcorn machine individually for a neighborhood movie night or similar event. Like all of our rentals, our popcorn machine is easy to use, easy to set up and requires few ingredients. Simply add popcorn kernels, oil, butter and flavoring and you can make delicious popcorn in any size. Make bags or tubs of popcorn for kids or adults to enjoy at your party while they watch a show, play games or relax outside. You can make popcorn on demand or keep the machine popping throughout the party to make sure everyone gets some. Order a popcorn machine for your upcoming festival, fair, fundraiser, church event, school event or even a family-friendly corporate event or a private party. Call toll-free (888) 752-0628, or locally (978) 767-2107, to reserve a popcorn machine rental in Boston and learn more about our many other party rentals.